Benjamin Franklin and Electricity letters - From 1747 to 1750, Benjamin Franklin sent a series of letters to his friend Peter Collinson in London explaining his experiments and observations about electricity. Peter Collinson was a member of the Royal Society, a group of men who promoted scientific observation and discovery of the world around them. Collinson later published Franklin's letters, with his permission, in a book he called "Experiments and Observations on Electricity Made at Philadelphia in America." This book became one of the most reprinted books of the eighteenth century and catapulted Ben Franklin to international fame. You can read the original Franklin letters below. 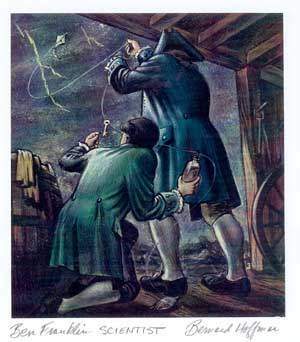 Peter Collinson first published the work on Benjamin Franklin and electricity in April 1751 under the title "Experiments and Observations on Electricity Made at Philadelphia in America." The original book consisted of four letters sent from Franklin to Collinson and one to John Mitchel. Later editions contained other letters both from and to Franklin. You can read each of the original five letters by clicking on the links below. If you are very interested in learning more about Benjamin Franklin and his study of electricity, you should really read the letters all the way through. They are extremely interesting and cover such topics as Franklin's discovering positive and negative electrical charge, his original suppositions about lightning rods and comical experiments he conducted using turkeys, wine glasses and other household items! After the list of the five original letters, there is a list of subsequent letters that were either published in later editions of the book or contain other interesting information about Franklin's studies. They are ALL very interesting reading if you would like to know more about Benjamin Franklin and electricity! First five letters included in "Experiments and Observations on Electricity Made at Philadelphia in America:"
Read our in depth article about how Ben Franklin began his electrical studies and made the observations about electricity that would change the world at our Benjamin Franklin and Electricity page here. Read our page of basic Facts about Benjamin Franklin here. And learn more interesting and little known Facts about Benjamin Franklin here. You can also read our list of Benjamin Franklin Quotes here.